The veterans of the USS Des Moines CA-134 gathered for their 40th reunion on August 7, 2015. They mourned the loss of the founder and longtime host, Paul Overly. Paul started the reunion at his home in 1975, where it was held every year since. He also served as the reunion group’s president since day one. He did much of the organizing and made it successful because of his personality. He made it a point of inviting and getting to know everyone who had served on the ship; he got to know the wives and familes as well. He always recognized and greeted everyone and made people feel special. Only eight (8) people attended the first reunion; back then they use to bring in a flatbed trailer and operate off of it. But over the 40 year history as many as 500 people have attended some years. The 2015 reunion had 125 registered participants including many who hadn’t attended in years. grandchildren and, since his passing, one great granddaughter. Jim was very involved with his boys and coached baseball and soccer. During that time, and for a total of 35 years, Jim worked for the Cincinnati Enquirer. He loved to play golf and travel with Marilyn in their motorhome (visiting all but 8 states) volunteering at state parks across the country. While reading a VFW magazine Jim found a notice about the USS Des Moines Reunion and immediately contacted Tom Earps. Tom and Jim and their wives attended their first reunion that year (1990) where he met quite a few of his shipmates. After that, he began looking for other shipmates (both alive and deceased); the group grew and friendships were renewed. 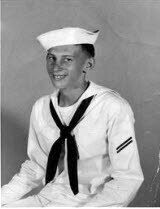 In 2000 and until his passing in 2011, Jim was voted Secretary/Treasurer of the USS Des Moines Reunion and began the USS Des Moines Reunion website.